1. Is anyone else out there following Emily Ley and her Simplicity Challenge on Instagram? Each day she publishes a new suggestion. I started January with a big closet/bathroom/refrigerator purge and her tip for Day One (be ruthless) really drove me. All the things in my closet that I didn't love got tossed into a box to donate. I also took the advice from a Closet Clean-Out article in my January Real Simple magazine to toss anything that "didn't do me any favors" (I thought this was a nice euphemism). So even those tops that I liked but that didn't fit right, or that I found myself having to fix all during the day, were gone. The idea was to keep items you were stoked to put on in the morning (or, you know, whenever). All the purging led to organizing and cleaning, a win/win! January just seems like the perfect time to clean and organize, am I right? Also, a sparkling clean refrigerator?? Heaven! We had very little in our refrigerator come January 2nd, so I seized the opportunity to take everything out and clean it. I'm talking the drawers, the glass shelves, everything. Then "Clean out your fridge" came up as the tip for the Day 6 and I got to pat myself on the back since it was already done. The one thing I haven't been able to do is set that recurring alarm for an hour before Parker wakes up... I know that on the days I do wake up super early, I get so much accomplished while he's sleeping, so I really want to make it more of an ongoing thing! 3. To up my "let's love everything winter" game, I made these too-adorable-for-words snowman marshmallows. I just took regular large marshmallows and piped on the faces using melted semi-sweet and orange-dyed white chocolate (just put a tiny bit into a ziplock bag, snip off the tip and you are good to go!). They were perfect in hot chocolate! Except that now, I'm itching to make real marshmallows from scratch. 4. Speaking of making things in the kitchen, I've had this ice box cake saved on Pinterest for forever and a day. I mentioned in passing to husby that I wanted to make it, and he looked at me like I was all sorts of crazy. Yes, we still have goodies leftover from Christmas. And, yes, it's literally freezing outside (we saw flurries over the weekend while playing T-ball in the backyard with Parker!). 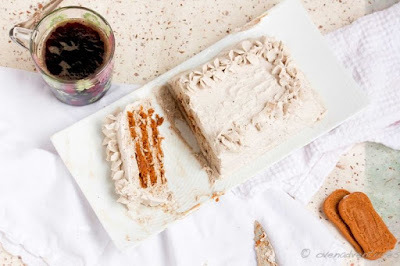 But a Biscoff Ice Box Cake just might have to make the menu one night this week! Thanks! They were a hit with P, too! We are actually using them for potty-training treats now, lol. 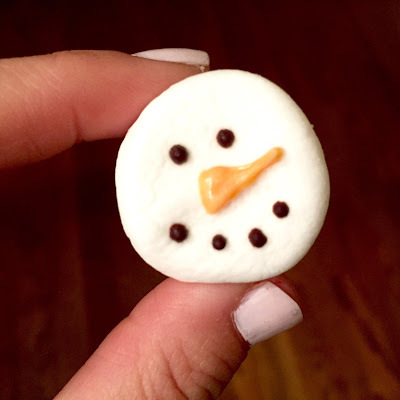 The snowman marshmallows are too cute! I've been following along with the Emily Ley challenge too - so many good ideas to simplify your life. Hope you have a great week! Those marshmallows are the cutest! !